The true recipe for rassolnik is a matter of debate between the capitals. Add the right way to make this traditional soup to the list of differences between Russia’s two biggest cities. The word “rassolnik” itself is derived from “rassol,” or pickle juice — the salty, sour watery solution that remains after making pickled vegetables. Traditional Russian cuisine includes many dishes with a pickle juice base:“kalya” is a caviar soup with pickled cucumbers; “pokhmelkas” are sour and spicy soups made as a kind of hangover remedy and “solyanka” is a soup made from pickle juice, meat and root vegetables. There are numerous recipes for rassolnik, but the most famous ones are the Moscow and Leningrad rassolniks. Residents of the two Russian capitals disagree about many everyday things - from the right words for entrance hallway, white bread and shaved meat sandwich - so it should come as no surprise that there is no consensus on the right way to make rassolnik. Leningrad rassolnik begins with beef broth. It may also involve mixing tomato paste into the vegetables while they are cooking. 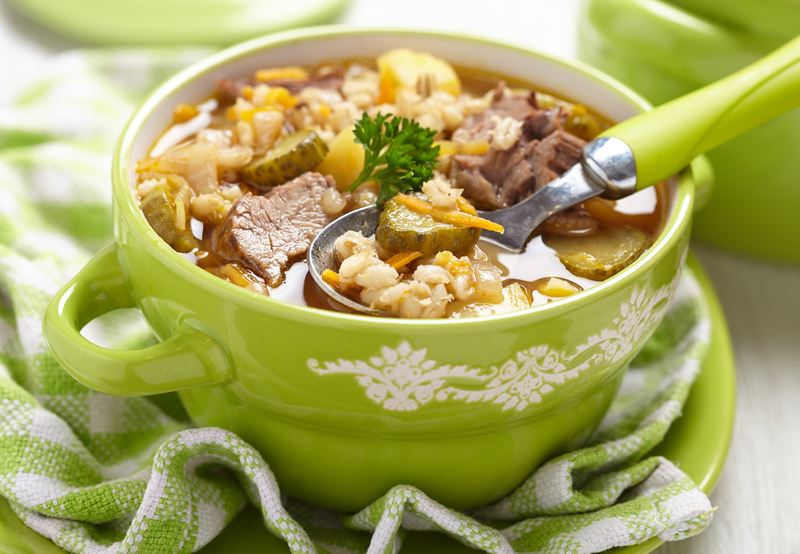 Pearl barley is another feature of Leningrad rassolnik. It should be steeped for a few hours before making the soup. Rice is an acceptable substitute for pearl barley. The soup is served with the sour cream. Moscow rassolnik is based on chicken broth — that’s the main difference between the two soups. Chicken or duck is the meat for the soup rather than beef. Historic recipes also suggest adding beef kidneys, but many leave that step out today. Moscow rassolnik also involves lots of parsley and celery root. Rather than sour cream, this soup is served with an egg mixture made by pouring a raw egg into warm milk and bringing it to a boil while stirring constantly for 3 minutes. Moscow rassolnik should be served with pies filled with sour cottage cheese. Here is a recipe for Leningrad rassolnik. Make sure and use pickled cucumbers rather than marinated ones. And homemade pickles are better than store-bought ones, which often contain too much vinegar. 1. Steep the pearl barley overnight. 2. Cut the meat into medium-sized pieces. Bring the water to a boil, then add the meat. Reduce heat. 3. While the broth is simmering, prepare the vegetables. Dice the onion, grate the carrot. Saute them together in a pan for about 5-10 min. until they are golden in color. 4. Add pearl barley to the broth. The barley should be ready in about 30 minutes, although it may take less time if it was allowed to steep overnight. 5. Dice the potatoes, add to the broth. 6. Cook 5-10 min., or until the potatoes soften. Add the onion and carrot. 7. Cut pickled cucumbers, add to the broth. Add herbs, salt and pepper to taste. Serve hot with sour cream. Priyatnogo appetita!